The U.S. Federal Aviation Administration (FAA) is alerting pilots on the risk of a potential takeoff data error due to runway number transposition. The FAA reports that in 2017 an airline identified a runway event which saw an aircraft utilize the carrier-provided Takeoff Performance System (TPS) data for runway 10L, while actual departure was off of runway 01L. This resulted in an actual takeoff runway length (for 01L) that was 4,220 feet less than what was calculated by the TPS (for 10L). The data provided for runway 10L offered three flap settings (1, 5, 15) and three thrust settings (22K, 24K, 26K) for takeoff. A setting of Flaps 1 and thrust 22K was selected. This resulted in a rotation at standard speed, and a takeoff with 400 feet of usable takeoff distance remaining. 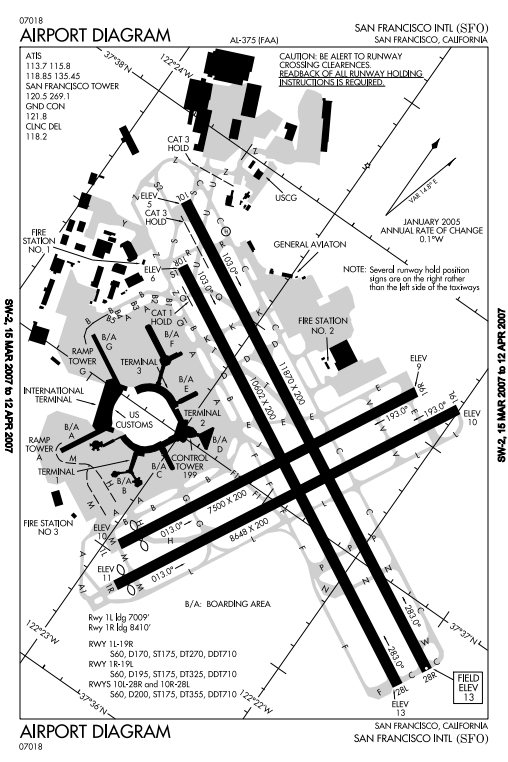 Although an FAA analysis identified several other U.S. airports with the potential of a transposition error involving runways of significantly different lengths, the majority of the runway transpositions occurred at San Francisco International Airport (SFO).